Kathy Ganske, PhD, is Research Professor in the Department of Teaching and Learning at Vanderbilt University. She has been involved in researching, using, refining, and teaching about word study practices since the 1990s. Dr. Ganske's work is grounded in extensive teaching experience in elementary classrooms. Her current research interests include vocabulary development during small-group word study instruction and literacy reform in challenging schools. 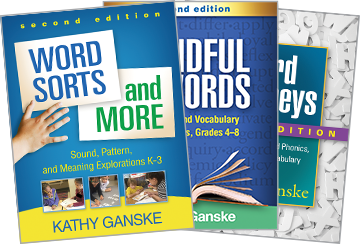 Dr. Ganske is the author, coauthor, or editor of several books, including Word Journeys, Second Edition; Word Sorts and More, Second Edition; Mindful of Words; and Comprehension Across the Curriculum, as well as numerous articles and book chapters. Read a Q & A with Kathy Ganske, our June 2018 Author of the Month!